Audi too has started facing the heat or just that the carmaker wants to take a lead in the Luxury carmaker and hence wants to play safe this year. Last year the carmaker was short of BMW total sales by just less than 400 units, Audi is now banking on lower models to increase the total sales volumes and become market leader in 2013. The German car manufacturer has now come up with promotional offer of taking home an Audi A4 by just paying down payment of Rs 5 Lac and the balance in 36 EMI's at 0% finance. 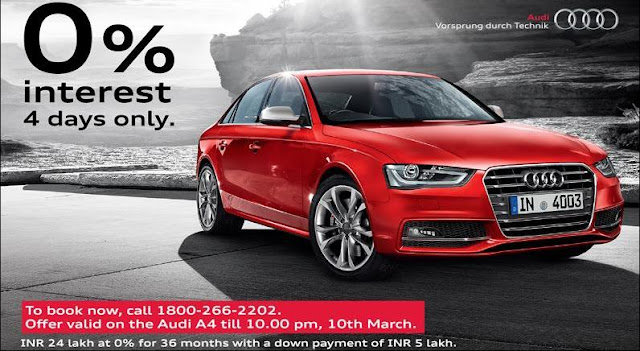 The total amount financed by Audi would be INR 24 Lac for a period of 36 months at 0% interest but hurry up the promotional offer is only for 4 days until 10th March 10 PM.